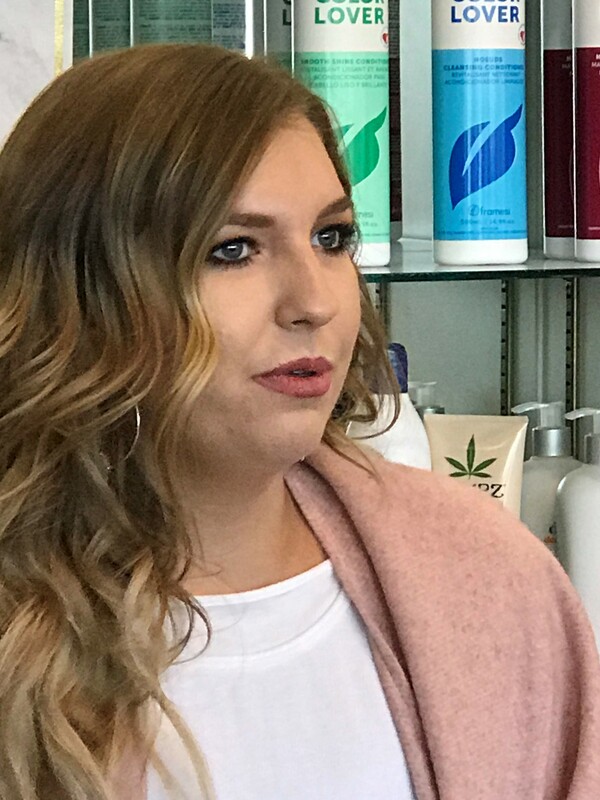 High fashion, including trending hair and makeup styles, is now available at the new Studio K Salon owned by 21-year-old Katelyn Edwards. The Chamber of Commerce, county and city officials, friends and family came out to celebrate the ribbon cutting of Studio K on Wednesday, December 5 at 11 a.m.
Katelyn, the county's youngest business owner to date, graduated from McDowell Technical Community College's Cosmetology School and has furthered her education through industry seminars and specialty training. She graduated from the Atlanta (GA) Makeup Academy and is certified natural beaded rows hand-tied hair extensions. She purchased the business and the building from Wanda Hyder and Laura Beam who had owned and operated the successful salon as Magic Act for more than 50 years! "I've always known I wanted to own a salon," she said. "​From the time I graduated cosmetology school, I reached out to Laura and Wanda and asked them to keep me in mind if they ever considered selling." According to Wanda and Laura, it was a fortunate turn of events as they have every confidence in Katelyn to continue providing the great service and grow the business to which they had dedicated their lives. Under Katelyn's ownership, the salon will continue providing the same services and both Wanda and Laura will maintain their booths, she said. "Laura and Wanda have always provided the best service and I am so honored to have them here to help me as I work to grow the business," she said. The new and expanded services that will be offered include nails, facials, bridal services, hair and eyelash extensions, and the balayage style of hair coloring. Katelyn's niche is special event styling for weddings and other momentous occasions for which she has completed extended training. There are a total of seven booths available for clients and men, women, and children are welcome. Katelyn and her staff are looking forward to providing quality services to their clients here in Marion. Her drive and passion serve as a great example to all in the community that one doesn't have to leave McDowell County in order to make dreams come true. "For anyone who may be looking to leaving Marion, I suggest they think again," she said. "Marion is truly becoming what it was always meant to be. I am so thankful to be a part of the growth that entrepreneurs are bringing to the area." Studio K is located at 35 W. Court Street and can be reached at 828.652.5424.